Siisu Mumuni has a bachelor’s degree in history (B.A History), from the Kwame Nkrumah University of Science and Technology (KNUST). Thus, he considers himself a Social Scientist. He also has a certificate in computer technology, which complements his social science degree. Siisu lives in Langbinsi with his extended family of 13, which includes his Mother and Father, 8 siblings, and his wife and a son. Siisi has been interested in teaching since childhood. During his high school and university years, he used all his vacation time in doing voluntary teaching at Frukan Junior High. He did his National Service as a teacher in Tuna Senior High in 2012/2013 academic year. 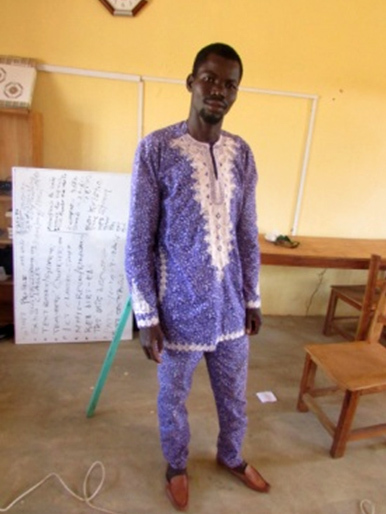 He is currently the ICT (Information and Communication Technology) teacher in La’angum Learning Centre. Siisu is a very creative and handy man. He able to translate what he sees or reads concretely with the hand. Siisu aspires to be a social reformer by analyzing things in the theological perspective and by being a good example in his daily life. He says, “when the body relaxes, the mechanism of the body also relaxes”. He therefore keeps himself busy with subsistence farming. Siisu is sociable, friendly and embraces views from other religious faiths. He uses these to strengthen his faith and love for everyone because he believes that friendship is one of the most important values in human life.